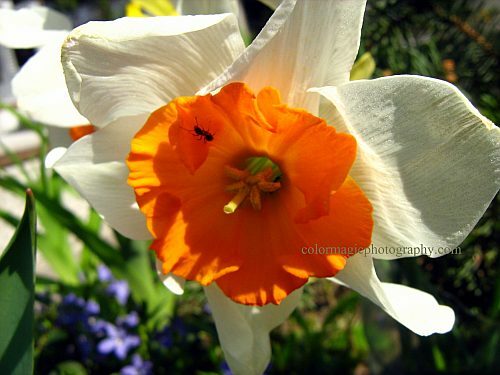 I have a lovely daffodil macro with a bonus ant for today's post. Daffodils are bright, cheerful spring flowers, feeling our hearts with joy and hope. Great macro shot of the beautiful daffodil, Maia! That's a great close up! Though I have not seen an orange daffodil. We have yellows. That is a beautiful daffodil. The ones in my yard are still about a week away from blooming. I love the photo. Nice shot. A beautiful spring blossom, fantastic shot .. The play of light and shadow highlighting the beauty of the daffodil is remarkable! Gorgeous photo! Lovely flowers again and yes with a cute critter!